"You can't stop love in action..."
- lyric from "Love In Action"
Todd Rundgren, much like David Bowie, is one of those unadulterated rock and roll chameleons. While Rundgren hasn't gone through as many glaring physical reiterations as Bowie, he has certainly done so musically. From his early solo singer/songwriter stuff, throughout his thematic pop projects with Utopia, to some radio friendly solo pop, to the techno/Internet presence of his TR1 period, Rundgren has always relished and welcomed change. As a record producer, his circle of influence goes even further, though detractors are quick to point out that Rundgren has a tendency to make a lot of acts sound like his sometime band Utopia (witness The Tubes' Remote Control disc or the early 1990s debut from Canada's The Pursuit of Happiness). His commercial success of late has been modest, but he has continued to modify and reinvent his creative catalog by releasing a slew of remixes and variations of his own music. 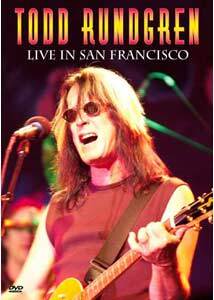 This concert disc, recorded live in June 2000 at San Francisco's Maritime Hall, found vocalist/guitarist Rundgren performing as part of a power trio along side Utopia bassist Kasim Sulton and one-time Tubes drummer Trey Sabatelli, before a small but appreciative crowd. Rundgren's signature merging of blues, jazz and rock elements (generally all at once) is spread across fifteen tracks, with a few classics mixed in next to some his newer material. Emphasis here is on guitar solos, as if Rundgren were eager to show that he can still bend the strings with the best of them. The disc opens with soundcheck footage from various locations across the country, before segueing into the opener, I Hate My Fricken ISP, in which Rundgren again tries to reinforce his Internet savvy. The set list is eclectic, and with only fifteen tracks from a career that spans decades, this is just another part of his rather large, unconventional live repertoire; unconventional in that he never simply plays his biggest hits, but rather pulls out a constantly changing set list, drawing on his deep and impressive catalog. True to form and not content to just play his songs as written, he transforms one of his biggest radio hits (Bang The Drum All Day) into a solo ukulele rendition, complete with an inspired Lion Sleeps Tonight bridge. I was pleased that One World (which is easily one of the greatest three minutes ever recorded) found a place onto this disc. Image Transfer Review: Presented in 1.33:1 full-frame, this live concert disc suffers from that common bane of the overly hot red stagelights, which tend to bloom unnaturally. Some of the audience shots, of which there are really very few, reveal some heavy grain at times. Colors and fleshtones vary, dependent on the lighting effects, but remain solid. This is a no-frills concert, and the image transfer is on par with that. Audio Transfer Review: The DTS mix on this disc is the preferred choice, offering a substantially deeper rumble than the included 5.1 track provides. The performance of Rundgren's power trio is captured well, though his lead vocals occasionally sound slightly buried in the mix on some of the faster tracks. This disc has a very "live" sound to it, with adequate separation and the audience largely relegated to the rear channels. A 2.0 English surround track, far less impressive than either the 5.1 or DTS, is also provided. Extras Review: No extras at all on this disc, not even lyric subtitles. There aren't any flashy effects or crazy camera angles here. This is three-man rock and roll from one of the most prolific guys in the business; hell, there's even a drum solo during The Ikon. Not the definitive live Rundgren (I'll still take Back To The Bars, thank you), but this live disc has a strong cross-section of songs, all meant to be played LOUD.